Coffee. Organs. Sheep. What more could you ask for? 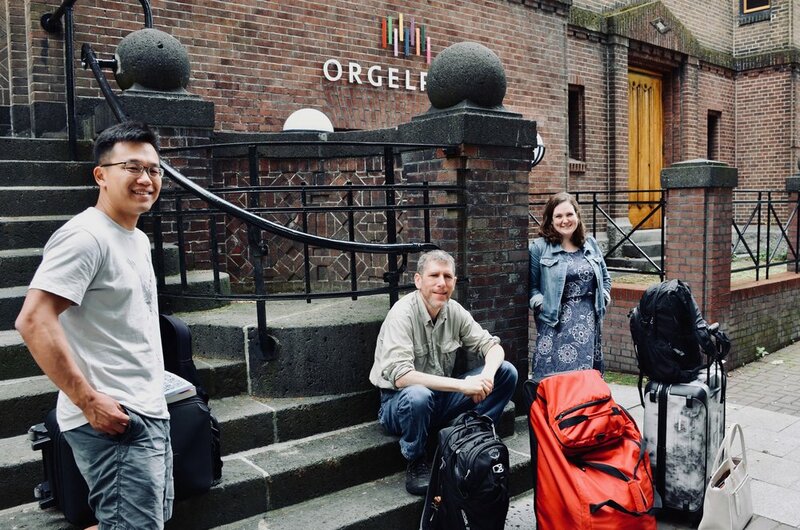 Adrian Cho, Chris Porter, and Chelsea Keating chat outside Orgelpark in Amsterdam. Chris L., Chris P., Cho, and I met at Orgelpark at 2pm. Chris L. had just arrived in the country and come straight from the airport and Cho had recently arrived from Geneva. Chris P. had taken the train in from Utrecht, a nearby city, and I had come from Museum Park where I spent the morning at the Rijks and Van Gogh museums. Jennifer, coming from visiting a local friend, and Corey, who had been exploring Amsterdam the last week, met us shortly. Brandon met us later in the day. I, for one, particularly enjoyed having this time outside Orgelpark to dogwatch, as a steady stream of canines passed enroute to the adjoining Vondelpark. Hans Fidom, a Professor of Organ Studies at VU University Amsterdam and Leader of the Orgelpark Research Program — not to mention extremely talented organist — welcomed us in. He made us much needed cups of espresso (my third of the day...) as he told us about the formation of Orgelpark. Long story short, a business man of the packaging industry wanted to give back to society - creating The Utopa Foundation and financing Orgelpark. What exactly IS Orgelpark? (Hint: not a green park as I initially thought.) Orgel (Dutch for organ) park is a one of a kind concert hall filled with NINE organs and two pianos. 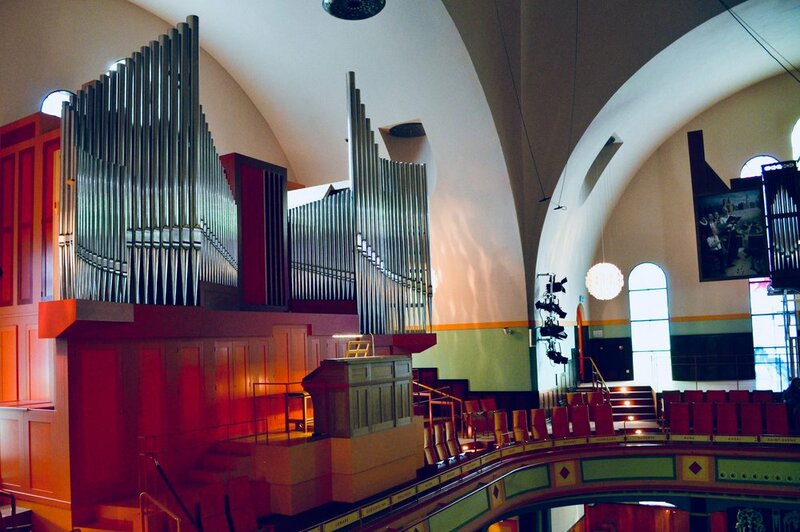 Built in 2007, the goal of Orgelpark is to bring organ music to the mainstream and artists together - not just through performances but through education and research as well. Performance take place on a frequent basis and patrons fill the 120-person space to the brim. When you enter hall, there is an organ everywhere you look; there is nothing like it anywhere in the world. It has to be the happiest place on earth for an organist — as you could move between instruments as you’d move at a park between the slide, swings, and roundabout! We focused on five of these organs, playing the largest three. Hans Fidom demonstrates the new Utopa Baroque Organ at Orgelpark, Amsterdam. Boston Organ Studio. Hans first demonstrated the new Utopa Baroque Organ, a recent addition based on a Hildebrandt organ in Germany that Johann Sebastian Bach had a hand in building. The blue and white facade with gold ornate accents was beautiful. The advantage of an organ like this, and the other organs in the hall, is that when you play, it closely reflects how the music originally sounded when it was composed. After Hans captivated us with a piece of Bach, he left us on our own to take turns playing the two manual pipe organ with a crisp and airy sound. We then migrated to the red, large French Verschueren organ. Focusing on French composers such as Widor, the group brought its boisterous principals and delicate strings to life. The Van Staten blockwerk organ in Orgelpark, Amsterdam. Chelsea Keating pumping the Van Staten organ in Orgelpark, Amsterdam. Boston Organ Studio. Hans returned to show us the Van Staten organ, a fascinating replica of an organ from 1492. The organ had shutters, depicting intricate scenes of musicians and their adoring audience. 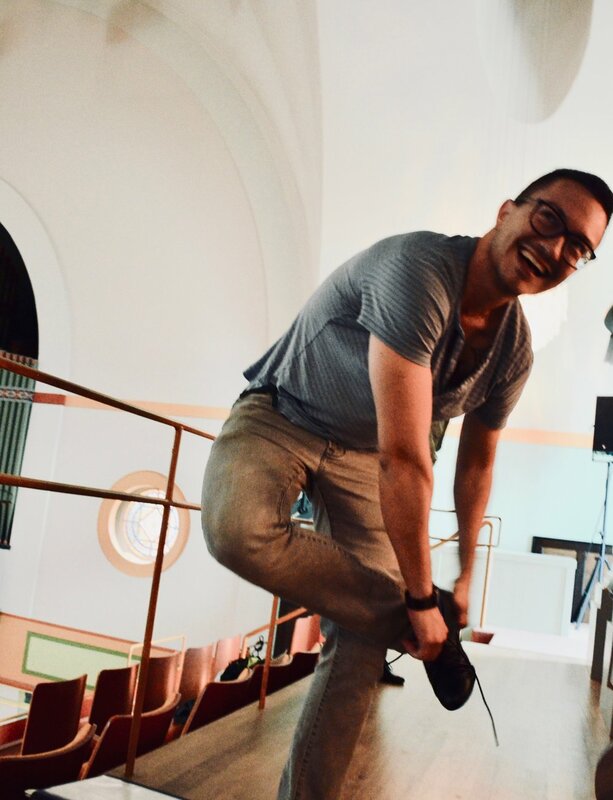 The two manuals and a pedal board, each with only one sound option, had to be manually pumped (way harder than Corey made it look - I was struggling...). Shortened ranges and wider keys than usual made it a bit of a struggle to play, but we pulled it off! Back to the new baroque organ. In addition to its attached mechanical key-action console, the organ is connected to a digital console in the center of the hall that Hans demonstrated at the end of the day. This console is also connected to a SECOND organ, the building's original Sauer (German-romantic) instrument, whose pipes are greenish façade at the front of the room. Both this concept and this console were mind-blowing to us, and he could have spent three days just demonstrating its myriad capabilities. Hans Fidom, director of the Orgelpark in Amsterdam, demonstrates the MIDI functionality of the new Baroque organ. Given its ability to control and manipulate palates within the organ's wind chests individually, its ability to manage the wind supply dynamically, and its complex MIDI functionality, the organist can create combinations of sounds that mimic those typically produced by electronic synthesizers. Indeed, I couldn’t begin to fully grasp its capabilities! I think we all would have loved a week to simply explore its functionality. Since the baroque organ's inauguration in March 2018, twelve original compositions had been written specifically for this organ using this system — which, for at last the time being, is unique in the world. Corey De Tar holds his ears as the (very loud) "Busy Drone" organ plays at Orgelpark, Amsterdam. Quickly before leaving, Hans demonstrated “The Busy Drone,” a barrel organ that was initially built as a dancing organ for an outdoor café and then used by a publishing company at their book fair to draw a crowd. Hans fed the machine a music roll of traditional Dutch music and we backed away, having been warned it would be loud. And, it was...loud. The instrument used to be called “The Busy Bee” but was renamed to drone as there’s an underlying drone sound to it. The happy music would definitely draw a crowd wherever it was used; it reminded me of the carnival music used to draw in visitors. We thanked Hans for his time before finding a pub to eat dinner (with a live-in cat that I absolutely had to pet until it took a swipe at me in the traditional cat fashion!). Resident sheep at our Airbnb! After a 2-hour drive north to the countryside of Friesland, we ended our day at a lovely house in the Dutch countryside ...after a brief stop at the wrong house with a surprised owner. Awkward. Bleeting sheep and gorgeous greenery led to a peaceful end to a great first day. Adrian Cho, Chris Porter, and Chelsea Keating outside of Orgelpark, Amsterdam. Hans Fidom of Orgelpark generously pours coffee for the group. Hans Fidom, director of Orgelpark, explains the history of the institution. Hans Fidom and members of Boston Organ Studio inside Orgelpark, Amsterdam. Hans Fidom speaks, with the Van Staten blockwerk organ behind. Orgelpark, Amsterdam. 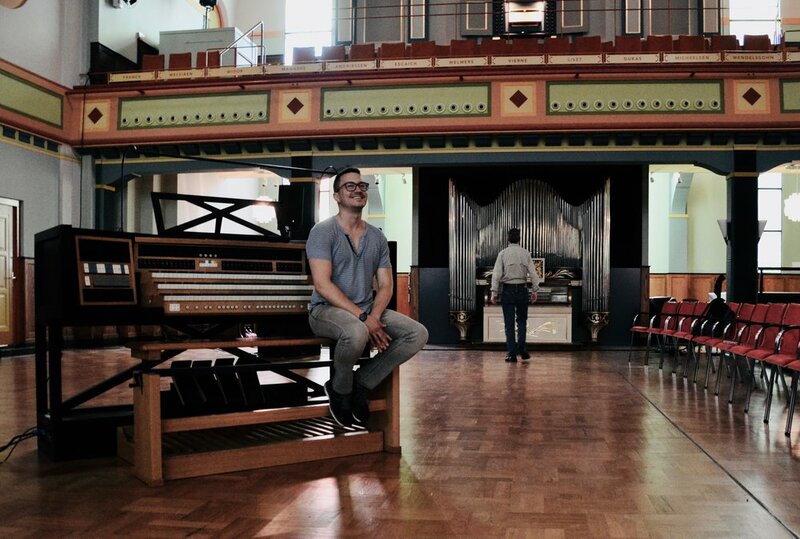 Corey De Tar listens intently, with the façade of the Sauer organ at Orgelpark behind. The Van Staten blockwerk organ in Amsterdam. Corey De Tar at the electronic console of Orgelpark, Amsterdam. Hans Fidom demonstrates the 2018 Utopa Baroque Organ in Orgelpark, Amsterdam. Adrian Cho plays the new Baroque organ in Orgelpark. Boston Organ Studio. The Verschueren French-romantic organ in Orgelpark, Amsterdam. Chris Porter plays the new Baroque organ in Orgelpark, Amsterdam. Despite a sprained ankle, Jennifer Hsiao is all smiles at Orgelpark. Boston Organ Studio. Corey De Tar is smiles at Orgelpark, Amsterdam. Boston Organ Studio. Corey De Tar at the console of the Baroque Organ in Orgelpark, Amsterdam. Boston Organ Studio. Jennifer Hsiao plays Bach at Orgelpark, Amsterdam. Boston Organ Studio. Chelsea Keating plays the Baroque Organ in Orgelpark, Amsterdam. Chris Porter plays Franck on the French romantic organ of Orgelpark, Amsterdam. Console detail of the Verschueren French-romantic organ in Orgelpark, Amsterdam. 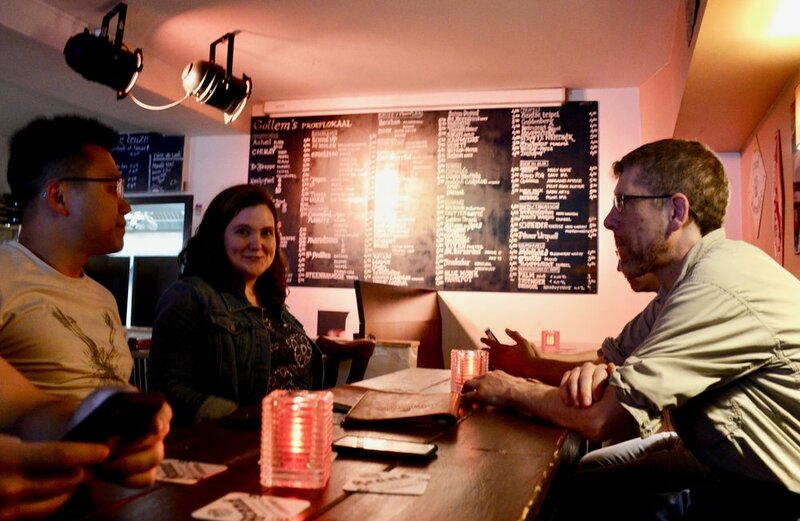 Chelsea Keating observes at Orgelpark, Amsterdam. Jennifer Hsiao at Orgelpark, Amsterdam. Hans Fidom at Orgelpark, Amsterdam. The MIDI capable console or Orgelpark, Amsterdam. Hans Fidom demonstrates the MIDI capabilities of the electronic console at Orgelpark, Amsterdam. Hans Fidom operates the mechanical organ at Orgelpark, Amsterdam. Chelsea Keating and Chris Porter at dinner. Christian Lane at dinner in Amsterdam. The common room at our Airbnb in Holland.